Egg layers, the Andalusian will lay three large, white eggs a week up to 160 a year. 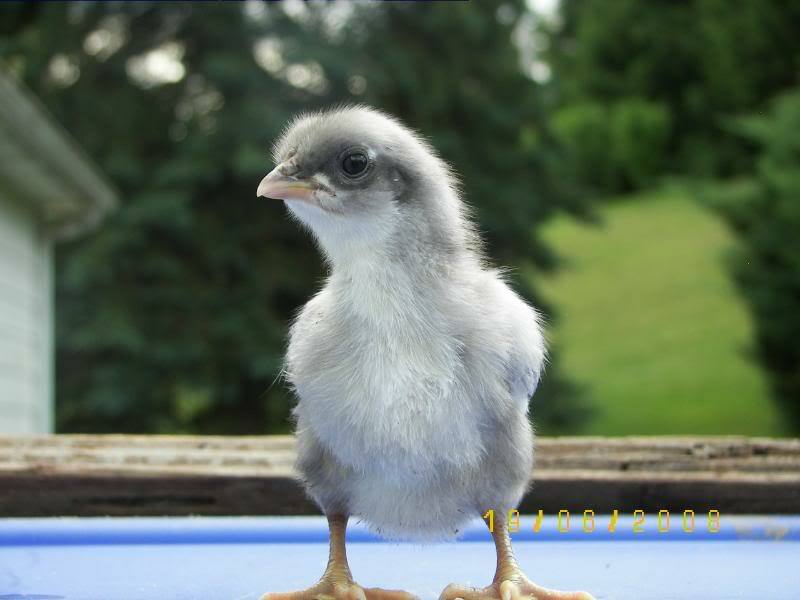 The pullets start laying early as five months of age. Hens often make noise prior to laying and will cackle for several minutes after the event. Andalusians often lay eggs far into the winter months. With their close feathered plumage, Andalusians tolerate cold weather well. They will withstand confinement but do best with ample opportunity for foraging. Known as an active breed, they run fast. Andalusians seldom brood. The combination of these characteristics contribute to their predisposition toward feather eating. Besides their prodigious egg production Andalusian have a stunning show plumage of dark blue feathers fringed with a black tips. 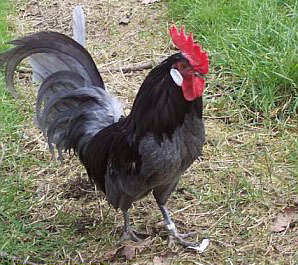 They sport a single red comb with matching long wattles contrasted by brilliant white ear lobes. With their piercing brown eyes and sharp black beak they have a stately bearing in the ring. Andalusians from the same brood can have a black or black mottled plumage. 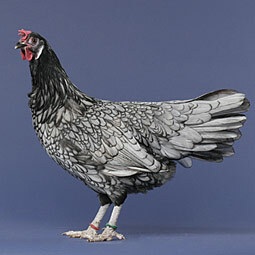 The American Poultry Association (APA) only accepts the bright, black-laced, blue-feathered species in show. Show- quality Andalusians come about rarely and only as a result of genetically monitored breeding. As a cold-hardy breed the Andalusian demand few comforts in the coop. However, outside of the coop they need a large run with ample space for foraging. Researchers have seen feather eating problems among foragers like the Andalusian but have yet to fully understand all the reasons. However, they have formulated suggestions for Andalusian owners which can really help ward off feather eating. Andalusians may eat feathers to replace protein lost in their egg production. Give them extra protein in the form of enhanced chicken feed or supplement their feed with cat food. Chickens eat all the time. Foragers like the Andalusians sometimes eat eat to relieve boredom. Make sure that they have plenty of food, water, greens, and black oil sunflower seeds. Provide diversions e.g. an old log full of bugs for them to chase. Part of the Mediterranean class of chickens, the Andalusian gets it name from a province in Spain. Spain exported the Andalusian to England and America in the 1850’s. The Blue Andalusian resulted from the breeding of a white Andalusian with a black Andalusian. The famous geneticist Gregor Mendel used Andalusians in his historic experiments with dominant and recessive genes. 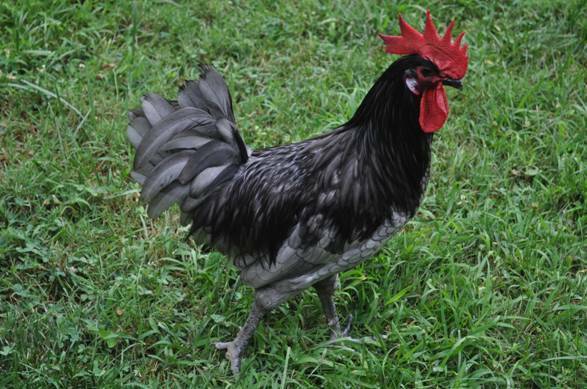 The low percentages of show-quality Blue Andalusians secured only through genetic breeding make the breed too expensive and time consuming for the average chicken farmer. Consequently, Andalusians have grown quite rare.